I have built mini CNC plotter using some old DVD drives the inspiration for which came from this video. The build uses an Arduino Nano and two L293D motor driver IC's (Not boards). The video included links to a couple of gcode images and an Arduino Sketch which appears to listen for serial data (the gcode file) and activate the stepper motors and servo to perform the drawing of the image. 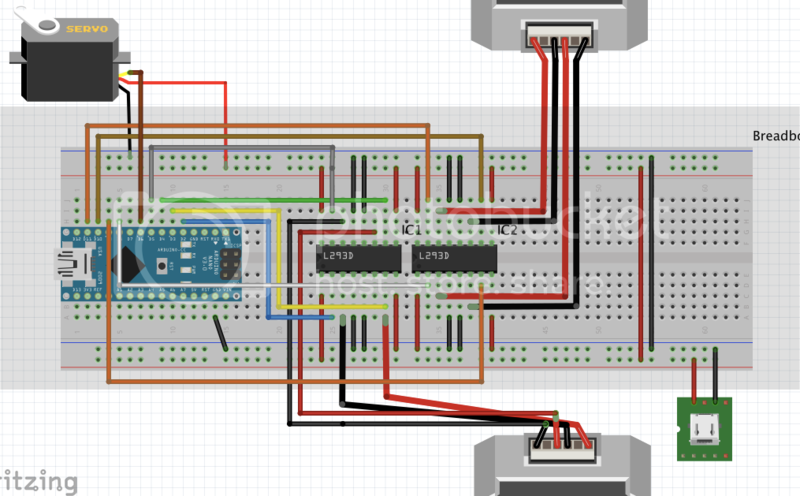 The promise of a second video on how to use it never materialised however the creator Tapendra Mandal, has uploaded a simplified model but now appears to be using a motor driver board. What I need help with is how to get my existing (the original machine) working. I have done loads of research about using GBRL and UnversalGcode Sender etc but just as I get one thing working I hit another problem. I seem to be getting confused with what software I need on the Arduino to listen to data (the image file) being sent from a PC / Mac and then manipulating the stepper motors and pen connected to a servo (up and down). Last night when studying this I uploaded some code to the Arduino just to get the stepper motors turning to check the wiring. They still did not turn but I could hear a faint whining from one of the motors in time with the code (simply spinning clockwise, delay and the counter clockwise) Something is working but not correctly. I am using the 5v output. So can anyone help me get my DIY CNC machine working and printing images? I am using a MacBook Pro but also need to be able to do this on a PC. Here is my circuit in Fritzing (amended from my original). 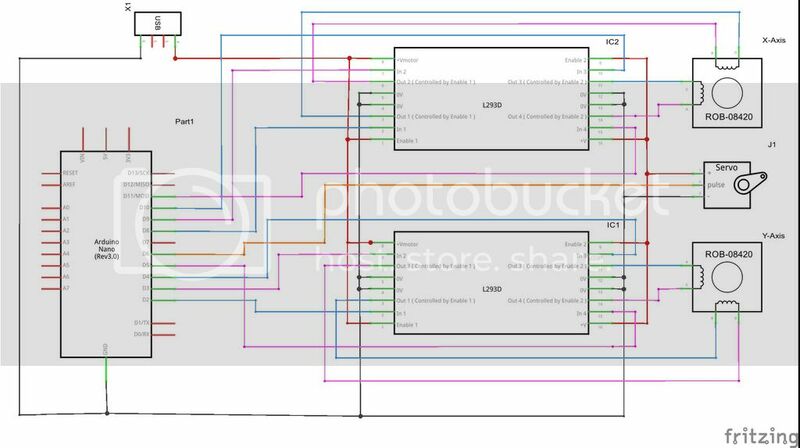 Here is a thread I started regarding the electronics here regarding connecting everything up.